No matter how much time you have on the French Riviera, you really can't go wrong. Everywhere you turn you'll find beautiful buildings, food, beaches, and views. 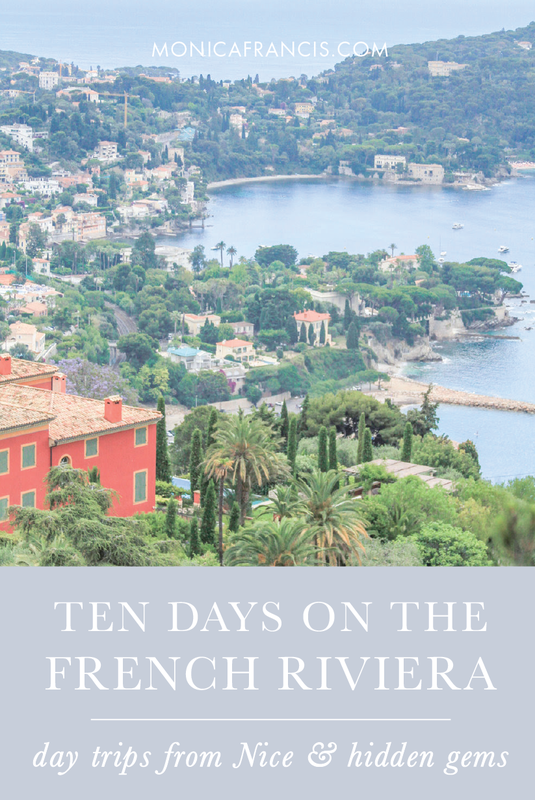 On the other hand, no matter how much time you spend, you can't quite see everything - I still have a few spots on my Riviera wishlist, like Mougins, Hyères & Île de Porquerolles, and Villa Ephrussi on Saint-Jean-Cap-Ferrat. In this guide, I'll introduce you to the ten cities we visited along the Côte d'Azur, from famous spots and favorite beaches to a couple hidden gems. And if you're planning to head further west into Provence, take a look at my posts about The Coast, the Luberon Villages, and Aix-en-Provence. If you're flying into the French Riviera, you'll most likely arrive to Nice's airport on the coast. You might notice a sign announcing this is the "Gateway to the Côte d'Azur", and it is! With its central location, an international airport, trains to almost everywhere, and plenty to do, Nice is a perfect place to stay while you're exploring the region. Colorful and busy, Nice is a bit more casual than many of its ritzier neighbors. Set aside at least a day for the city itself, even if it's your home base. Walk the Promenade des Anglais, which stretches over four miles along the shore. At the eastern end of the promenade, climb the stairs up to Colline du Chateau for panoramic views over the coastline and city below. On the beach, splash out on a chair at one of the many private beach clubs - the rocky shore isn't exactly comfortable for laying out on a towel. Don't miss the old town of Nice, Vieille Ville. It's home to an impressive flower market, Fenocchio ice cream, cafés serving socca (large chickpea crêpe, a local staple), and shops selling everything from tourist trinkets to cool vintage clothes. Nearby you'll find the famous Place Massena, and you can follow the main boulevard to shopping like the classic French department store Galeries Lafayette. There are plenty of patisseries around town for a quick breakfast or a sandwich to go - or buy both in the morning, and pack the sandwich as a picnic lunch for your day trip. For a sit-down meal, try the pretty Café de Turin, Le Bistrot du Port, or La Rotonde, a carousel-themed brasserie at the famous Hotel Negresco. Just a 30 minute train ride from Nice, Menton is as close as you can get to Italy without actually crossing the border. It's smaller and quieter than most towns along the coast, except for one week each February when the annual Lemon Festival takes over completely. During the rest of the year, a half-day visit should be all you need to visit the colorful harbor, take in the views of France and Italy from the Basilique Saint Michel, spend some time on one of the many un-crowded beaches, and have a crêpe or a fabulous meal. Of course you could stay all day and enjoy the peaceful beaching or explore the gardens, museums, and Jean Cocteau murals dotted around Menton. Twenty minutes from Nice by train, Monaco is the opposite of a hidden gem - it's famous, exuberant, and altogether larger-than-life. With so much to see and do packed into the glittering city-state, it demands at least a full day of your time. Be sure to take some time outside of Monte-Carlo and visit the old town of Monaco-Ville. A small medieval town perched high above the sea, Èze is an easy place to stop on your way to or from Menton. It only takes a couple hours to see the entire village, so you can keep your visit short or stay into the evening for dinner. The train station at Èze is at the bottom of the hill, so plan for a hike up into town unless you're traveling by bus or car. If you can't make it to every town on this list, it's good to note that Èze offers a taste of the artistry of Saint Paul-de-Vence, has two perfumeries from Grasse (Fragonard and Galimard), and has some of the best views and restaurants of the entire Riviera. File this one under "must visit." Right around the bend from Nice, it takes just 10 minutes to reach Villefranche-sur-Mer by train, 20 minutes by car, or take your time with a scenic walk or bike ride (public bicycles are readily available for rent in Nice). This harbor town is usually overshadowed by its iconic neighbors, but it's the perfect spot for a relaxing evening and dinner along the marina. The beach here is also a good alternative to busy Nice, and the colorful buildings will definitely make their way onto your Instagram feed. Saint Paul-de-Vence is perched on a hilltop about 30 minutes from Nice by car (or an hour on the 400 bus), but it's certainly worth the inland trip. A bit larger than Èze village, this town has played host to some of the world's greatest artists over the years. In an afternoon you can see almost every pretty street, stop into shops and galleries, and visit Marc Chagall's final resting place. You face a tough decision in Antibes: town or beach? Of course, you should choose both if you can - but it will take at least a full day. It's an easy 30 minute train ride from Nice, and you can stop at either Antibes (the city) or Juan-les-Pins (the beach town). If you're walking between the city and the beach, plan for a 20 minute trek. Juan-les-Pins beach is one of the busiest beaches I saw on the Riviera, but also one of the best: clear, shallow water, soft sand, and beautiful views of the mountains and the sea. Public and private beaches are equally busy here, so you can enjoy a lounge chair, locker, and food service or find a spot to roll out your towel for free. We opted for the latter, and I soon realized that I'm no match for the Mediterranean sun without a beach umbrella. In the city of Antibes, walk the Promenade Amiral de Grasse along the shoreline for the best views of the city and the sea. This town is more relaxed than most of the Riviera, so take your time to admire all the pastel buildings, and walk through the daily Marché Provençal - not so different from the markets in Aix. Visit the Picasso Museum for their small, well-curated collection and wonderful seaside views. Balance all your walking with a dinner at Brulot Pasta & Vino. Grasse is considered the perfume capital of France, and therefore of the world. Its microclimate is particularly suited to growing flowers, which they celebrate with a Jasmine Festival in August and a Rose Exhibition in May. Any time of year, you can visit the three main perfumeries in town. Galimard is the oldest perfumery in Grasse, established in 1747; Molinard is next, from 1849; Fragonard is the youngest, begun in 1926. Each parfumerie has free tours, shops, and a museum to explore. You can even make an appointment to mix your own scent - they will keep your formula on file so you can order more in the future! Fragonard also owns a museum of Provençal Clothing and Jewelry and a museum of works by the Grasse-born painter Jean-Honoré Fragonard, for whom the perfumery is named. Both collections are worth a visit if they pique your interest. A half-day is perfect for visiting Grasse. After 45 minutes on the train from Nice, take either a steep hike or a quick bus ride up the hill into town. You'll certainly want to take a full day in Cannes, if only to make time to visit Île Saint Honorat. In the morning, arrive to Cannes after a 30 minute train (or drive) from Nice, and explore all your glamorous surroundings. In the afternoon, escape out to this small island that's home to a group of monks and the delicious wine they make - it's just as wonderful as it sounds. Because Saint-Tropez is further from Nice (1.5 hours by car, though we had none of the rumored traffic), you'll want to set aside a full day here. Like in Antibes, the beaches at Plage de Pampelonne are separate from the city itself. The three-mile stretch of sandy shoreline is dotted with public and private beaches, none of which were crowded in late June. The classic Le 55 Club was here even before Brigitte Bardot's famous scene in ...And God Created Woman was filmed, but we enjoyed a day at Manoah Beach. When you've had enough of lounging in the sun, head into town to shop for sandals at K. Jacques and try the city's signature pastry at La Tarte Tropézienne. Walking through the streets at sunset, you might notice that Saint-Tropez seems like the older sister of Cassis - a bit more grown up and glamorized, but still with a strong family resemblance. Close out the day with dinner at Sénéquier or around the corner at Le Gorille.